The goal with restorative dentistry is to restore the tooth to a normal function and appearance and to help protect the pulp. The restoration may also prevent further damage to the structure of the tooth. A variety of materials may be used depending on the desired goal of the restoration and the location. Dogs can apply a tremendous force to their teeth so many restorative techniques used in people are not recommended in dogs. Restorative dentistry may be used in the following situations: endodontic procedures, tooth fractures, enamel defects, enamel hypoplasia, caries (tooth decay), and worn teeth. A crown may be recommended for broken teeth that have had root canal therapy. Metal crowns are usually recommended, but tooth colored crowns may also be an option. A crown helps to restore the function and strength to the damaged tooth. Crowns may also be indicated for teeth that have been weakened due to enamel damage or wear. Placement of a metal crown requires at least two different anesthetic procedures. 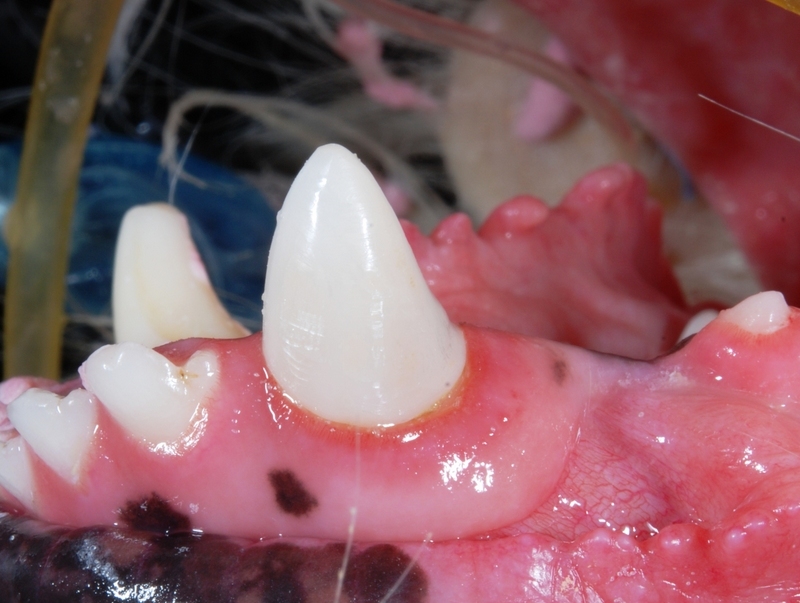 Dental caries (tooth decay) is occurring more frequently in dogs. Dogs are generally less susceptible to caries compared to humans due to their diet, tooth shape, and higher salivary pH. Dental caries are most often found on the premolars and molars toward the back of the mouth. Treatment requires removing decaying material and placing a tooth-colored restoration (filling). Advanced dental caries may require extraction or root canal therapy.